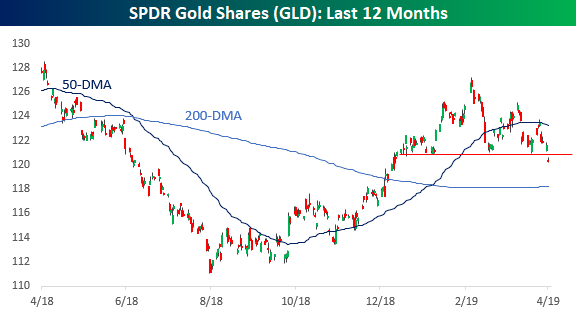 After a strong start to the year, gold has been having a tough time since mid-April, and after breaking support at around the $121 level today, the SPDR Gold Shares ETF (GLD) has done more than a roundtrip since the start of the year. 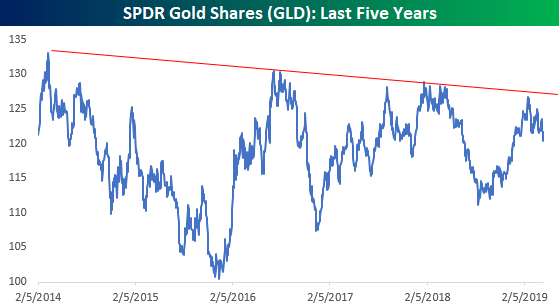 With support at this year’s lows now broken, the technical picture doesn’t appear to be too positive for GLD. 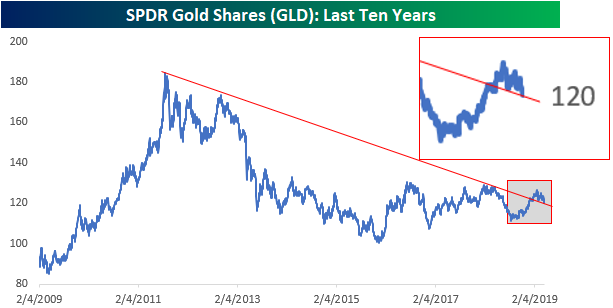 Zooming a bit further out than just the last year, the five year chart for GLD doesn’t look much better. From this vantage point, the rally to kick off 2019 marked just one more in a series of lower highs. From a ten-year window, GLD is still down sharply from its peak above $180 back in 2011. The encouraging aspect of this chart, though, is that this year’s rally does appear to have broken the downtrend that has been in place since that peak. With that in mind, bulls on GLD could look at this recent pullback as a test and kiss-back of the downtrend line at around the $118 level and therefore is not as big of a negative as the break of support in the first chart would suggest. With GLD trading just above $120 now, that will be a key level to watch going forward. Any break significantly below $118 would spell trouble. Start a two-week free trial to Bespoke Institutional to unlock the full Bespoke interactive research portal.